The "season" begins...on Salt Spring Island. Enjoy! So...now it begins...the amazing Pacific Northwest Coast "season"...May to October. As we segue to the close of April, we can see the flowering forward of our natural world. 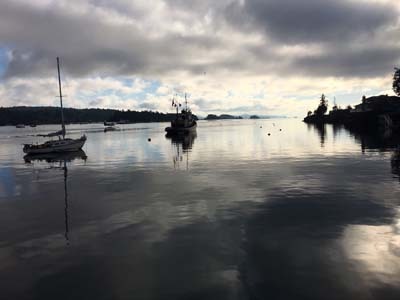 On Salt Spring, orchards are abloom, gardens are welcoming, lambs are in pastures, boaters are ready for their sea adventures, kayakers are paddling to Chocolate Island. Galleries are open in Ganges Village, studio tours throughout the Island are available, special events in theatre, music, dance are all underway at ArtSpring. The Spring season roster is in place at the Indoor Pool, the Library's special community events are there to enjoy, and the walking/hiking trails are beckoning: Ruckle Park, Burgoyne Valley Park, Mt Maxwell Park, Mt Erskine Park, Channel Ridge trail system...discover your spaces and special places. Fresh menus at our stellar restaurants: Twig and Buoy (at Fernwood), Piccolo's, Hastings House (Bistro and Fine Dining), Auntie Pesto's (in Grace Point), Salt Spring Inn, Rock Salt (at Fulford), Treehouse Cafe, Seaside (at Vesuvius)...patio pleasures await. It's Spring-into-Summer time, and we unfold along with Nature. Enjoy.